An inside look at the work and adventures of Harry Hopkins and Averell Harriman in the creation of history's most remarkable international partnership After the fall of France in June 1940, London became the center of world political theater. For the U.S. president, the vital question was: could Britain, with American help, hold out against the might of Nazi Germany? While keeping the United States officially neutral, Franklin D. Roosevelt devised an unprecedented strategy, leading to the revolutionary idea of lend-lease. But was Winston Churchill - famous as a speechmaker but regarded by many as a reckless politician and possibly a drunk - a good bet? To find the answer, Roosevelt dispatched his closest associate, Harry Hopkins, to Britain on a mission. 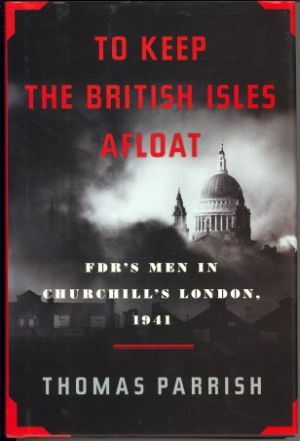 Hopkins's endorsement of Churchill put an end to FDR's doubts, and with the passage of the Lend-Lease Act the president sent Averell Harriman, a wealthy financier and entrepreneur, to London "to keep the British Isles afloat." For Harriman, the assignment turned out to be the great adventure of a remarkable life. Filled with vivid details and great storytelling, To Keep the British Isles Afloat explores the still-misunderstood beginnings of the unique Anglo-American alliance in World War II, offering an intriguing new look at Roosevelt's thinking and a fresh perspective on the relationship between the president and the prime minister. This book is 'remaindered' and may have marks on the cover and/or bottom of pages. This is a "remaindered" book with a black mark on the page bottom. Otherwise it is just like a brand new book.